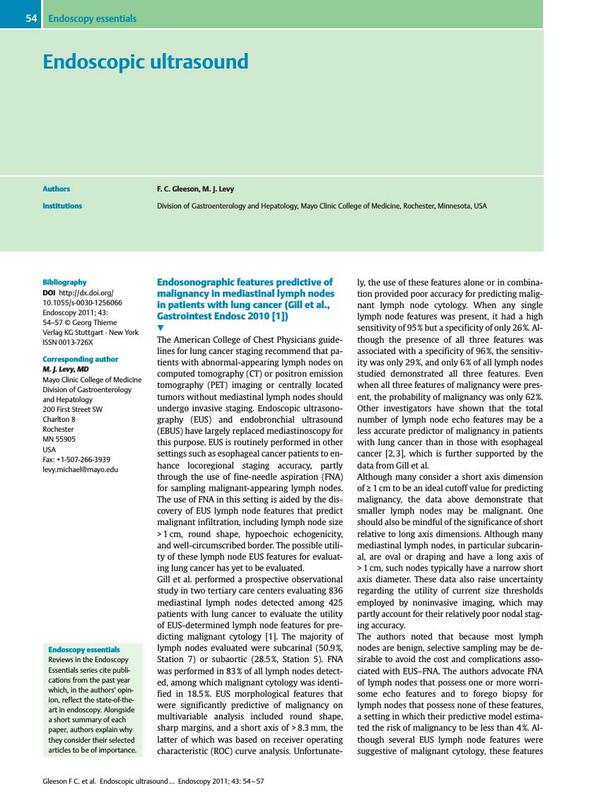 The American College of Chest Physicians guidelines for lung cancer staging recommend that patients with abnormal-appearing lymph nodes on computed tomography (CT) or positron emission tomography (PET) imaging or centrally located tumors without mediastinal lymph nodes should undergo invasive staging. Endoscopic ultrasonography (EUS) and endobronchial ultrasound (EBUS) have largely replaced mediastinoscopy for this purpose. EUS is routinely performed in other settings such as esophageal cancer patients to enhance locoregional staging accuracy, partly through the use of fine-needle aspiration (FNA) for sampling malignant-appearing lymph nodes. The use of FNA in this setting is aided by the discovery of EUS lymph node features that predict malignant infiltration, including lymph node size > 1 cm, round shape, hypoechoic echogenicity, and well-circumscribed border. The possible utility of these lymph node EUS features for evaluating lung cancer has yet to be evaluated. Gill et al. performed a prospective observational study in two tertiary care centers evaluating 836 mediastinal lymph nodes detected among 425 patients with lung cancer to evaluate the utility of EUS-determined lymph node features for predicting malignant cytology . The majority of lymph nodes evaluated were subcarinal (50.9 %, Station 7) or subaortic (28.5 %, Station 5). FNA was performed in 83 % of all lymph nodes detected, among which malignant cytology was identified in 18.5 %. EUS morphological features that were significantly predictive of malignancy on multivariable analysis included round shape, sharp margins, and a short axis of > 8.3 mm, the latter of which was based on receiver operating characteristic (ROC) curve analysis. Unfortunately, the use of these features alone or in combination provided poor accuracy for predicting malignant lymph node cytology. When any single lymph node features was present, it had a high sensitivity of 95 % but a specificity of only 26 %. Although the presence of all three features was associated with a specificity of 96 %, the sensitivity was only 29 %, and only 6 % of all lymph nodes studied demonstrated all three features. Even when all three features of malignancy were present, the probability of malignancy was only 62 %. Other investigators have shown that the total number of lymph node echo features may be a less accurate predictor of malignancy in patients with lung cancer than in those with esophageal cancer  , which is further supported by the data from Gill et al. Although many consider a short axis dimension of ≥ 1 cm to be an ideal cutoff value for predicting malignancy, the data above demonstrate that smaller lymph nodes may be malignant. One should also be mindful of the significance of short relative to long axis dimensions. Although many mediastinal lymph nodes, in particular subcarinal, are oval or draping and have a long axis of > 1 cm, such nodes typically have a narrow short axis diameter. These data also raise uncertainty regarding the utility of current size thresholds employed by noninvasive imaging, which may partly account for their relatively poor nodal staging accuracy. The authors noted that because most lymph nodes are benign, selective sampling may be desirable to avoid the cost and complications associated with EUS–FNA. The authors advocate FNA of lymph nodes that possess one or more worrisome echo features and to forego biopsy for lymph nodes that possess none of these features, a setting in which their predictive model estimated the risk of malignancy to be less than 4 %. Although several EUS lymph node features were suggestive of malignant cytology, these features used alone or in combination were poorly predictive of nodal status. And while the cost must be considered, the risk of lymph node FNA is nominal and given the poor predictive value of EUS lymph node features in this setting, there is a potential impact on patient care. The same is also true in the setting of EUS rectal cancer and cholangiocarcinoma staging, where the nodal appearance poorly predicts malignancy, thereby mandating a low threshold for FNA regardless of lymph node appearance  . Similarly, when evaluating patients with lung cancer, our practice is to sample at least one lymph node from every station where lymph nodes are detected regardless of appearance. The use of this approach may have led to a higher rate of malignant lymph node detection. In the Gill study, only 17 % of patients were found to have malignant lymph nodes, which is below that reported in most EUS lung cancer staging studies. Correlation with surgical findings would have been useful to clarify the false-negative rate, which if elevated may have impacted the study findings. Finally, cytological samples interpreted as suspicious for malignancy were deemed positive for malignancy in calculating the diagnostic test parameters. The inclusion of suspicious as indicative of positivity may have skewed the findings and also indicates that the number of biopsy passes performed (median 4; range 1 – 9) is insufficient in an unspecified number of patients. There is clear need to identify other imaging features that may help guide or even obviate the need for FNA. Until such time, FNA will remain a key technique for enhancing nodal staging accuracy, and the findings of this study can be used as a benchmark for clinical care and future study.